60 million girls’ Mobile Learning Lab is designed to get quality schooling to the rural poor where large class sizes, a lack of trained teachers and limited access to traditional educational materials, mean that many children who are in school just aren’t learning. At first, it seemed like a lofty idea. How could a small, volunteer-run organization help to overcome the seemingly intractable problem of inferior educational outcomes for poor children in rural, isolated communities? Yet after several years, and many hours of research and consultations with experts in both academia and software development, 60 million girls put together the first Mobile Learning Lab (MLL) to enable children to explore subjects of their own choosing, after school, through offline, interactive educational games, videos and tutorials, all charged by solar panels and designed specifically to improve learning outcomes. Have a look at the video to learn about how the Mobile Learning Lab works. Getting all children to learn is crucial. We know that education, especially for girls, is the key to development and leads to higher incomes for individuals, more economic growth nationally, better health, stronger gender equality, lower rates of child marriage, a better understanding of environmental issues and higher rates of participation of women in the political process. It is an absolute travesty that, globally, over 264 million children and adolescents are not in school. Yet, equally troubling, is the fact that even children who are in school are often not learning the rudimentary skills they need to get ahead. So while access is important, it is just not enough. Clearly, a new approach is needed to ensure not only a chance for children to go to school, but also to learn. With this background in mind, we felt that harnessing educational technology was the most effective way to improve learning outcomes for vulnerable children. Training enough teachers to meet demand, even at the primary level, could never happen quickly enough. And, transporting heavy and bulky textbooks to isolated communities with a poor network of roads was too complicated, logistically. We needed an inexpensive, small, lightweight solution packed with informative and engaging content – all of which is readily available to children in the global north where Internet access is ubiquitous. And so the Mobile Learning Lab was born. As you heard in our video, the MLL provides children access to offline learning materials. 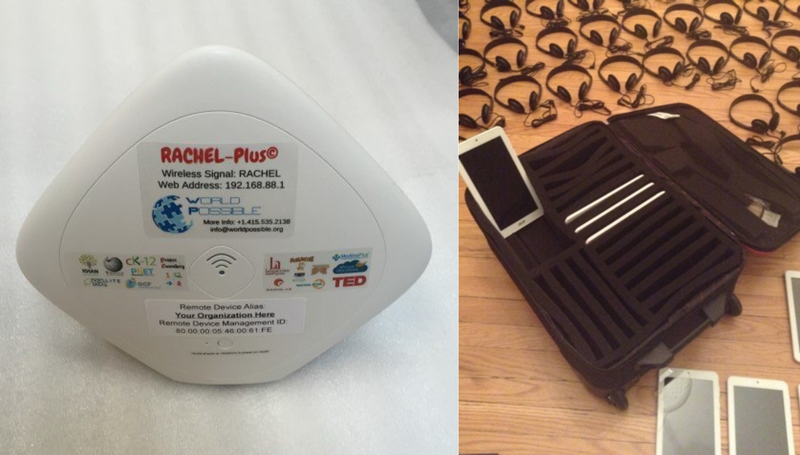 The MLL consists of a small suitcase filled with thirty 7’’ off-the-shelf tablets, a small solar charging system and a rechargeable server called a RACHEL-Plus (see photo below). The server, small enough to fit in the palm of your hand, can hold up to 500 GB of open source high quality offline content. Currently, the content includes a wide range of open source learning tools such as Wikipedia Academic, KA Lite (Khan Academy offline source for math and science tutorials), Fantastic Phonics and Feed the Monster for literacy, as well as thousands of e-books, encyclopedias, information on agriculture, geography, history, social sciences, and coding. This content can be custom-loaded for each community’s particular needs and can be modified at a distance at any time by simply hooking up the RACHEL-Plus to an Internet connection where available in a larger city. So, no Internet or electricity required. 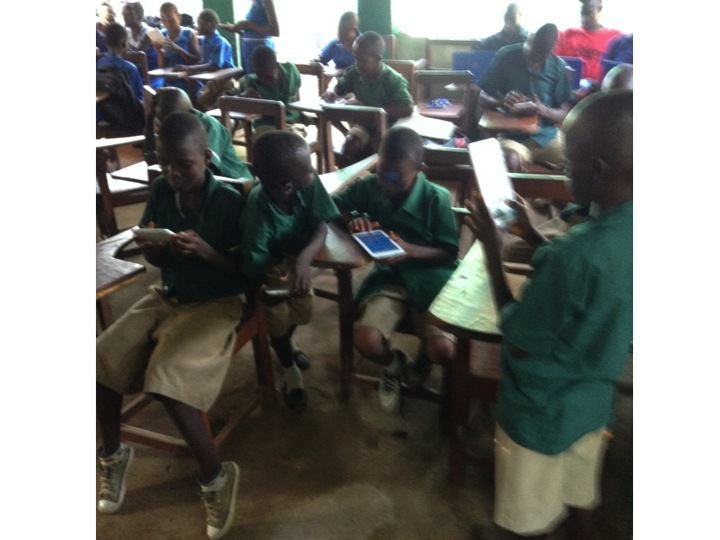 All learning materials are pre-loaded and the devices can be charged via solar panels. The total cost of an MLL, including 30 tablets, three solar panels and RACHEL-Plus is $5,000. In other words, the MLL can be set up anywhere in the world at a relatively affordable cost. Children work at the MLL after school, and at their own pace, by connecting to whatever programs interest them, or to subject areas where they need help. In other words, those who need a little extra help will have the tools at their disposal. And, those who want to advance their learning further will be able to do so as well. One of the main takeaways from our initial pilot project was that the children enjoyed the new learning tools; 86% of them kept returning to our initial learning centre and math scores improved. We are currently rolling out the MLL in remote communities in Sierra Leone’s Koinadugu district. To date, we have invested close to $100,000 since 2016 to further develop and test our concept and to conduct a full-year evaluation of 750 grade five students (boys and girls) in seven communities measuring math, literacy and non-cognitive skills before and after the intervention. Five communities have access to the MLL and two communities are serving as control groups in order to measure the overall impact. The final results will be available in the fall of 2018. If the MLL concept works in Sierra Leone, we feel that it will also translate to other countries, and other vulnerable populations. Start small but think big. We are a small organization trying to use technology to make a big impact to improve learning outcomes for children around the world. Please follow us on Facebook and Twitter to learn more about girls’ education and to keep up to date with our projects.